By : Dennis L. Greenlee, D.C., L.Ac. 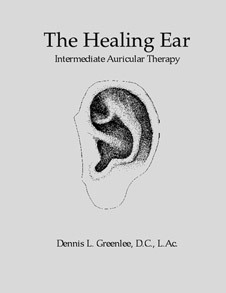 Because he had never seen a book on auricular therapy which would explain the basics, Dr. Greenlee set out to write one. He used his twenty years of experience to answer the questions he wanted to ask when he first started out. His book provides principles and basics, as well as procedures and approaches to various conditions (such as headaches, allergies, and emotional disturbances). For each condition there is a full-page chart showing only the points needed to treat that condition. All points are accompanied by a description of their functions, suggested frequencies and duration of treatment.